The last of the sextet of men so thoroughly identified with the annals of sea paintings is Emil Carlsen. He is not the youngest of the group, nor is he a native born, having first seen the light of day at Copenhagen, in Denmark. Yet he has been a citizen of this country for over two score years, he is thoroughly American in every respect, and he developed his talents among us. I have save him for the last because he is perhaps not only the most original of the six, but he beings to his art a poetical charm and a personal color note both unusual and delightful. Identified with still life for several years, from that going into landscape painting, Mr. Carlsen finally came to a serious consideration of marine pictures, and almost at a single bound leaped into merited fame. 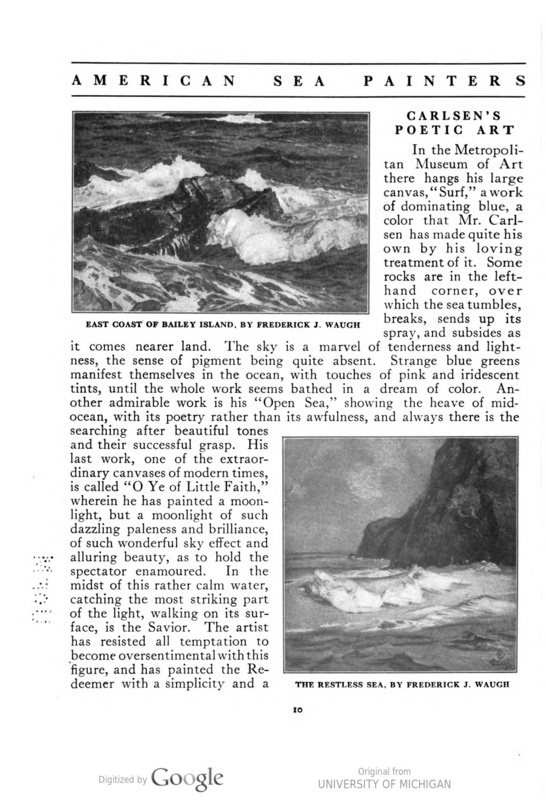 He confined himself to no particular mood of the ocean either, rendering surf, deep water, tranquil sea lapping the shore, but always in a manner entirely his own, and some of his moonlight effects were so novel, so delicate, and of such evanescent tonality as to be almost past belief. And to accomplish all this he invented a technique quite original, with a method of using his pigments that defied analysis. 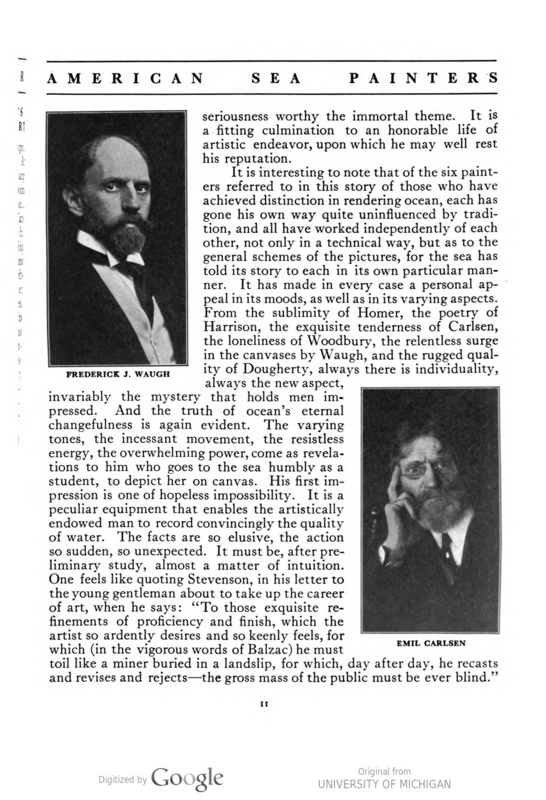 Occasionally he might have been charged with seeing that light that never was on land or sea, or insisting on a pale quality that defied what the painters call values; but in the end the refinement and the beauty were the excuse for any deviations he may have made from nature. In the Metropolitan Museum of Art there hangs his large canvas, Surf, a work of dominating blue, a color that Mr. Carlsen has made quite his own by his loving treatment of it. Some rocks are in the left hand corner, over which the sea tumbles, breaks, sends up its spray, and subsides as it comes nearer land. The sky is a marvel of tenderness and lightness, the sense of pigment being quite absent. Strange blue greens manifest themselves in the ocean, with touches of pink and iridescent tints, until the whole work seems bathed in a dream of color. 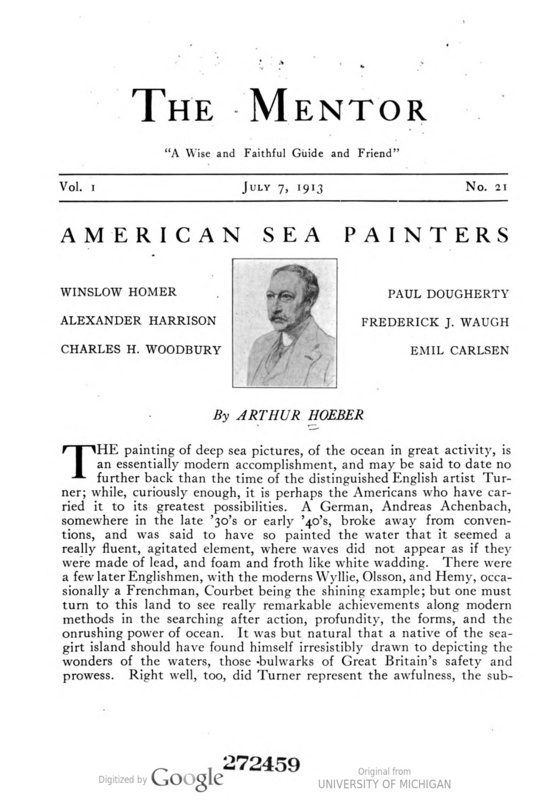 An other admirable work is his Open Sea, showing the heave of mid-ocean, with its poetry rather than its awfulness, and always there is the searching after beautiful tones and their successful grasp. His last work, one of the extraordinary canvases of modern times, is called O Ye of Little Faith, wherein he has painted a moonlight, but a moonlight of such dazzling paleness and brilliance, of such wonderful sky effect and alluring beauty, as to hold the spectator enamored. In the midst of this rather calm water, catching the most striking part of the light, walking on its surface, is the Savior. The artist has resisted all temptation to become over-sentimental with this figure, and has painted the Redeemer with a simplicity and a seriousness worthy the immortal theme. It is a fitting culmination to an honorable life of artistic endeavor, upon which he may well rest his reputation. 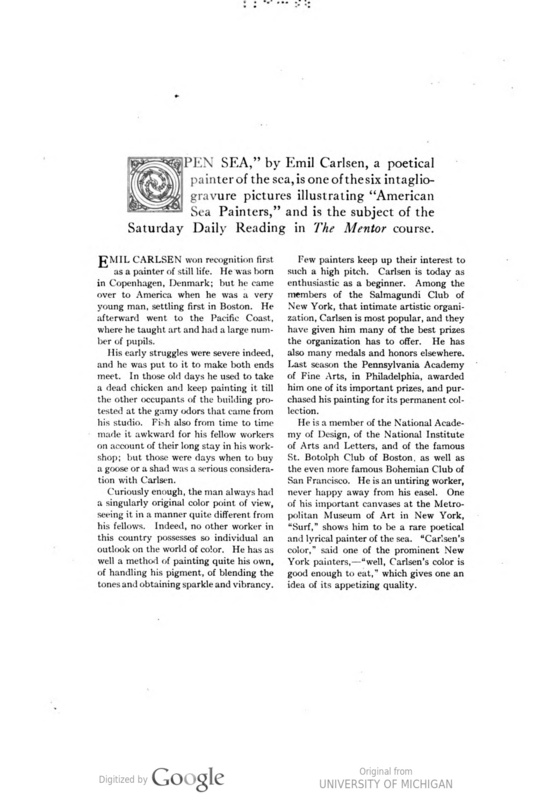 by Emil Carlsen, a poetical painter of the sea, is one of the six intaglio gravure pictures illustrating “American Sea Painters,” and is the subject of the Saturday Daily Reading in The Mentor course. Emil Carlsen won recognition first as a painter of still life. He was born in Copenhagen, Denmark; but he came over to America when he was a very young man, settling first in Boston. He afterward went to the Pacific Coast, where he taught art and had a large number of pupils. His early struggles were severe indeed, and he was put to it to make both ends meet. In those old days he used to take a dead chicken and keep painting it till the other occupants of the building protested at the gamy odors that came from his studio. Firsh also from time to time made it awkward for his fellow workers on account of their long stay in his workshop; but those were days when to buy a goose or a shad was a serious consideration with Carlsen. Curiously enough, the man always had a singularly original color point of view, seeing it in a manner quite different from his fellows. Indeed, no other worker in this country possesses so individual an outlook on the world of color. He has as well a method of painting quite his own, of handling his pigment, of blending the tones and obtaining sparkle and vibrancy. Few painters keep up their interest to such a high pitch. Carlsen is today as enthusiastic as a beginner. Among the members of the Salmagundi Club of New York, that intimate artistic organization, Carlsen is most popular, and they have given him many of the best prizes the organization has to offer. He has also many medals and honors elsewhere. Last season the Pennsylvania Academy of Fine Arts, in Philadelphia, awarded him one of its important prizes, and purchased his painting for its permanent collection. He is a member of the National Academy of Design, of the National Institute of Arts and Letters, and of the famous St. Botolph Club of Boston, as well as the even more famous Bohemian Club of San Francisco. He is an untiring worker, never happy away from his easel. 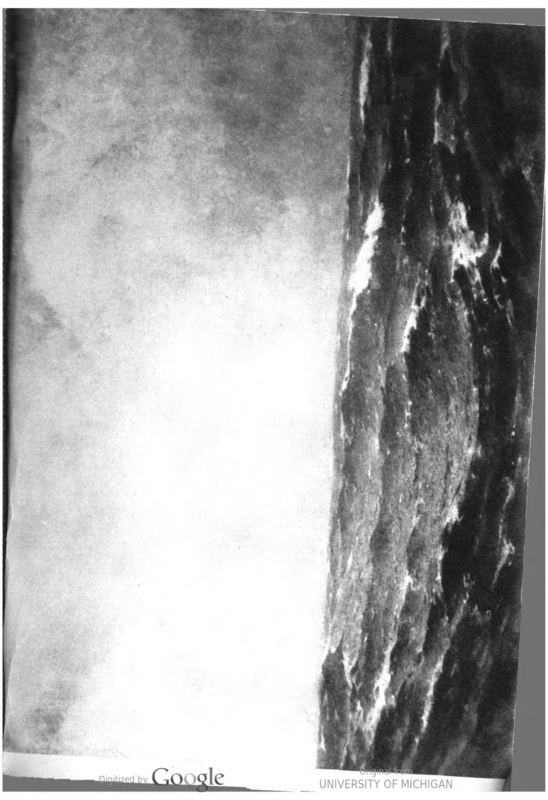 One of his important canvases at the Metropolitan Museum of Art in New York, Surf, shows him to be a rare poetical and lyrical painter of the sea. 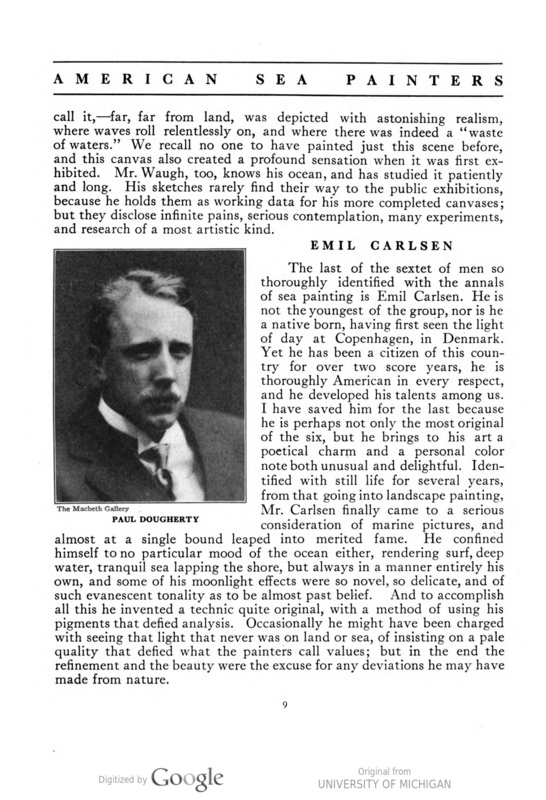 “Carlsen’s color,” said one of the prominent New York painters,—”well, Carlsen’s color is good enough to eat,” which gives one an idea of its appetizing quality.